We’ve come a long way from the days when battery-operated masks and little lighted bags along the sidewalk were high-tech. Spirited along by invention and 21st-century technology, Halloween inventions are an ever-exploding monster mash of creative possibilities. Americans spent $7.5 billion on Halloween last year, according to the National Retail Federation. But a happy Halloween is about so much more than a trip to the store. With each passing year, Halloween becomes more intricate to produce that hauntingly memorable costume, visual effect or party. Meanwhile, home and yard decorations are growing to near-Christmas proportions; 44.8 percent of Americans plan to festoon their property for All Hallows’ Eve. Companies around the world are always conceiving, strategizing, diagramming, producing and marketing in their quest for that Halloween innovation. Below, we feature some of the most otherworldly crazy and scary innovations ranging from high-tech eye candy to low-nutrition stomach candy. Boo? Yeah. So you’re planning a Halloween party and you need a speaking, “live” attraction to knock ‘em dead? Use your head. Talking skulls have become a popular choice among Halloween-related companies, especially as they become more custom-friendly. Spooky specimens at Fright Props (frightprops.com) feature a mouth and eyes that move via the easily connectable PicoTalk controller, using separate servo motors inside an assembly that rests on a Plexiglas plate inside the skull. You can even program the servo inside the skull; there are YouTube videos on this. The technology behind this and other kinds of animatronics has become an industry unto itself. Fright Ideas (frightideas.com) carries servo controllers, motor controllers, lighting controllers and more. Anyone who’s been to Chuck E. Cheese has gotten a firsthand view of animatronics, defined by Dictionary.com as “technology connected with the use of electronics to animate puppets or other figures.” Animatronic birds featured in 1964’s “Mary Poppins” marked the first use of the technology in film. These ain’t Chuck E. Cheese or Mary Poppins. 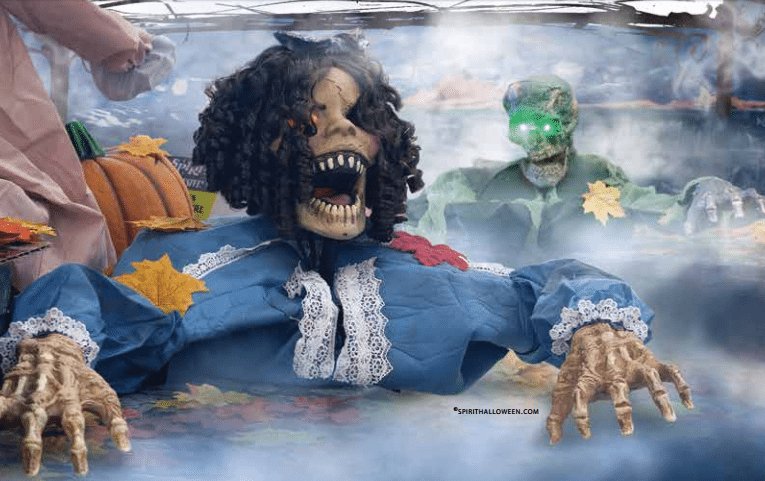 Spirit Halloween (spirithalloween.com) is among the companies featuring a glut of ghosts and creepy critters that you may wish weren’t so realistic in motion. Some members of Spirit’s exclusive “family”—like the 2.5-Foot Cerberus Three-Headed Dog with its fire-red eyes, glowing throats, menacing scowls and wild shaking—can be augmented with a fog machine or other props. The 5-Foot Floating Ghost Girl rises up a wall and utters an ominous warning. The 3-Foot Swinging Lil Skelly Bones dares you to come near with his glaring eyes and haunting chant. And the motion-activated 6-Foot Howling Werewolf, well, it shrieks for itself. Intellectual property giant Intellectual Ventures has an annual tradition of Halloween spirit, featuring inventions on its website (intellectualventures.com) that range from fog machines to invisibility cloaks. One of its more recent entries was a pumpkin carving kit that helps the everyday Eddie or Elvira fashion a truly standout and even sophisticated jack-o’-lantern. IV linked to Patent No. 4,828,114—with a listed inventor of John P. Bardeen on May 9, 1989. The world of generic, triangle-shaped pumpkin eyes was about to be smashed to smithereens. Today, Grampa Bardeen’s® Family Pumpkin Carving Set (grampabardeen.com) promotes pumpkin artistry via a kit that includes 10 Teflon-coated saws, three different-size drills, three steel-tipped pokers, two scoops (to remove the goop inside) and 16 fun patterns. The carving set was inspired by the notion of families working together to carve jack-o’-lanterns. In the Bardeen family, that tradition began 73 years ago in Racine, Wisconsin, when “Grampa” Paul Bardeen created tools to help the family carve creatively and safely—and without knives. According to the website, Bardeen used pieces of coping-saw blades inserted into wooden dowels to create the first fine-toothed saws designed for carving pumpkins. He also developed a method of transferring a pattern onto a pumpkin, using the tip of a nail to poke along the design lines of a paper pattern pinned to the pumpkin. Once the pattern was removed, one simply carved along the dotted lines for a more artistic carving. Not long after Paul Bardeen died in 1983, his children formed a company called Pumpkin Masters and created the first carving set on the market, complete with creative patterns. Even Gantom’s name says Halloween: It’s a combination of “Gan,” the company founder’s last name, and “phantom. This perfect-for-Halloween treat is gummy candy bugs that you unroll on a tape. It is aptly named, because its creators felt a little squishy about submitting it for licensing. While on a fly fishing trip, college buddies Adam Adams and Bill Ward decided to partner as inventors. From there, their journey to Bug Tape glory is a story of talent and timing. Almost 10 years ago, their licensing agent encouraged them to think candy concepts because they’re quick to market; more important, several major toy manufacturers were crossing into that realm. Adams and Ward chose bugs because of their play value, not to mention the creepy and icky appeal. The tape concept was novel and compact. But then the Great Recession hit, and the idea sat dormant like a dead bug in the attic. When product development experts Boston America and Edison Nation recently teamed for a search involving candy packaging and dispensing innovations, the two submitted Bug Tape despite thinking some of their other ideas might be a better fit. (Adams felt it was the duo’s least likely idea to get a licensing deal.) But Boston America loved it. The candy was licensed in January this year, debuted at the Sweet and Snacks Expo in Chicago in May. This candy has even been in the running for the Most Innovative New Product Award. Now it’s available at retailers throughout the United States. The creators must get a kick out of the fact that Amazon.com lists Bug Tape under “Grocery and Gourmet Food”. Adams remains active in product development. Meanwhile, Ward runs a rapid prototyping business and manages his restaurant in Ecuador. We hope none of the Bug Tape creatures end up in anybody’s soup.